Share love. Share kisses. Share ice cream. Just don't share cavities! Studies show that infants are not born with the bacteria that cause cavities, but that they are infected most often by their parents or caregivers.This route of infection is often referred to as “vertical transmission.” This vertical transmission takes place when the infant is kissed, milk or food is “sampled” for temperature, pacifiers are “cleaned” in the parents’ mouth, etc. It is not uncommon that whole families will be affected by the caries infection, which is important to keep in mind when treating the infection. One analogy that can be made is that treating the caries infection within a family would be similar to how one might treat a family infected with lice. It is important that all family members go through treatment simultaneously to prevent re-infection. New study shows 70% reduction in tooth decay among children whose mothers chew Xylitol sweetened gum. A recent clinical study published in the Journal of Dental Research reported on an innovative new caries prevention method by which treatment given to mothers reduced their children's tooth decay by over 70%. The aim of the study was to establish whether maternal consumption of sugar free chewing gum sweetened with the naturally occurring sweetener xylitol, could reduce the transmission of harmful mutans streptococci (MS) bacterial from mother to child and thereby reduce the risk of dental caries in their children. Earlier published studies have demonstrated that prevention of colonisation by these bacteria in early childhood can lead to reduction of dental decay and that mothers are the primary source of infection with mutans streptococci. These bacteria are passed from mother to child through everyday contacts such as kissing and tasting of food. The mothers were recruited for the study during pregnancy, and were assigned to one of three study groups. The xylitol group mothers chewed xylitol chewing gum approximately four times a day from 3 to 24 months after the child was born. 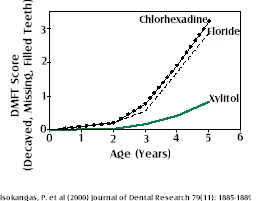 The mothers in the two control groups received fluoride (which does not affect MS transmission, but strengthens tooth enamel) or chlorhexidine (which is supposed to reduce MS transmission) varnish treatments at 6, 12, and 18 months post delivery. Otherwise, normal dietary and oral hygiene practices were maintained. The study measured the occurence of tooth decay in children at the age of five years: dental caries (dmft) in the xylitol group was reduced by 71-74% as compared with the two control groups. Thus, the mothers' use of xylitol chewing gum prevented tooth decay in their children by significantly reducing the transmission of mutans streptococci from mother to child in early childhood. "The results of this study suggest that intervention against MS colonisation may lead to better caries prevention than traditional preventive measures that concentrate on increasing the resistance of the teeth," stated Dr. Eva Söderling, the lead researcher of the Mother-Child study. The results of this study indicate that mothers could substantially improve their children's dental health by the simple process of chewing sugar free gum sweetened with xylitol, alongside their normal oral hygiene measures. Xylitol is a naturally occurring sweetener manufactured from natural sources such as birch wood, and has the same sweetness as sugar as well as unique dental benefits. It is widely used in sugar free chewing gum, confectionery and oral hygiene products.